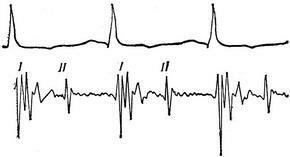 Phonocardiogram (below) and electrocardiogram in the third lead (top) healthy man: I and II of the first and second tone. Phonocardiography has a significant help in the diagnosis of heart disease, especially his vices. It allows to register separately the sound vibrations of low and high frequencies, which are poorly captured auscultation of the heart. Using FCG is possible to identify different tone changes, the appearance of surplus tones, to clarify the nature of cardiac murmurs.